Swan song that wasn’t delivered: pub rock paragons knock on the doors of posterity but have their rap unheard. 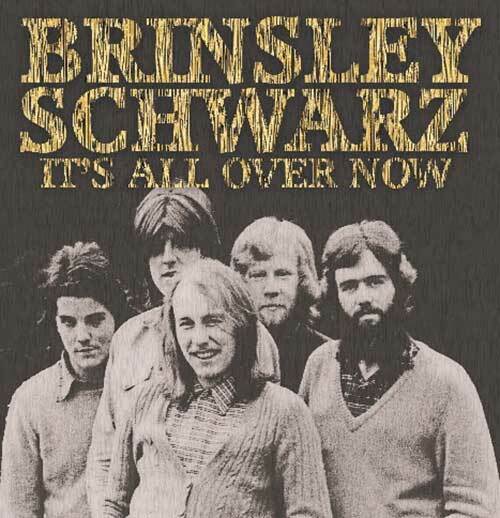 “It’s All Over Now” was a fitting title for the album BRINSLEY SCHWARZ got in the can back in 1974 in their desperate attempt to crack America. That didn’t happen, though, as the record hadn’t made it to a proper release and the group folded soon after, but it could – given the LP contained the original cut of “Cruel To Be Kind” which, basically in the same arrangement, would become a hit for the song’s co-writer Nick Lowe five years later. His partner in rhyme Ian Gomm got hold of the tapes and mixed them three decades down the line so, previously available on CDR only, this lost piece of history finally is out into the open to expose the band’s vulnerability in the face of failing success. Heavier on covers than their earlier oeuvre, and with swagger running from hilarious – as it is on the reggae-tinged title track and infectious opener “We Can Mess Around” – to genuine, the eleven cuts on display offer a softer outlook of the pub rock kingpins who polished all the sharp edges in favor of fickle commercial gloss. Boisterous bits like the twangy, organ-oiled instrumental “Do The Cod” that are true to the group’s nature win over anyway, no matter how delicate the Brits’ might be on “God Bless (Whoever Made You)”. There’s no false emotions, though, in the spirited soul numbers such as “I’ll Take Good Care Of You” or scintillating, ’60s-refracting guitar strum and vocal harmonies which pour mellifluousness on “As Lovers Do” before two distinct voices drive “Private Number” into a caramelized kind of rhythm-and-blues others would kill for. Yet this ensemble were prisoners of their own unglamorous image, so despite the riff that worked wonders for “La Bamba” and “Twist And Shout” and the memorable chorus, “Give Me Back My Love” wouldn’t stand a charting chance; so it was really over for the band who didn’t take BS lightly. Still, having the last puzzle element of their story to complete the picture is great.